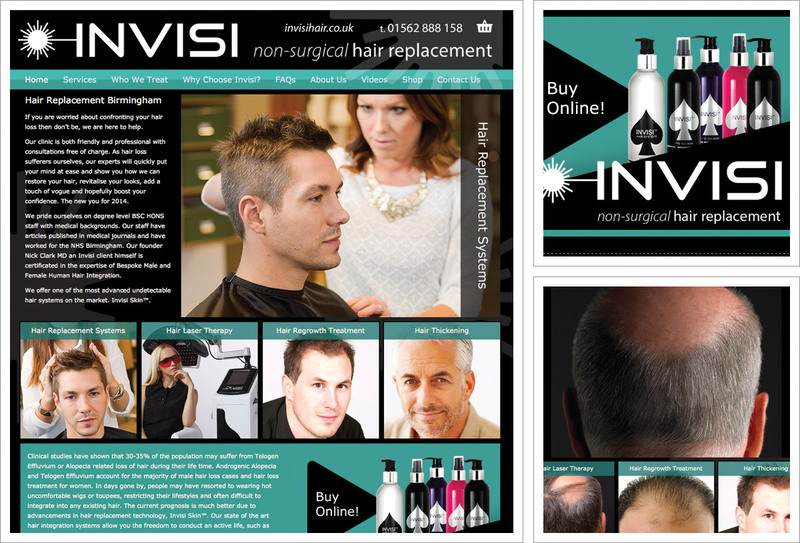 Invisi Hair have upgraded their website to a new and improved mobile friendly / responsive design. A long-standing Pedleyonline customer with a well established, successful website which had been around for a while, Invisi Hair made the wise decision to review the website, invest and improve. After a series of planning discussions had taken place we worked together to identify key objectives for the new build, website aims, timing, costings and a strategy for transition from the old site to the new. Key objectives were to make the site responsive, which means it can be viewed more easily from all types of devices and to ensure the website retained it’s rank at change-over with a view to building on this for future improvement. This was achieved by retaining pages and content, refining, improving and re-organising where required and also through use of 301 re-directs to ensure that where someone may be trying to access an old webpage that they will be safely transported to the new equivelant webpage. A widescreen layout, light background, dynamic content, new graphics and re-sized images all helped transform the appearance of the site. The addition of a hair loss blog enabled us to move yet retain vast amounts of informational content allowing key information to sit centre stage. WooCommerce provides full e-commerce store functionality for a range of hair restoration products and this includes a password protected Trade-Log in area. Strong branding, call to action and links to Invisi Hair social media channels.